Mon - Sat: 7 a.m. - 5 p.m.
give you a free estimate first! WE CARE ABOUT YOUR PROJECT! ASK US FOR A FREE ESTIMATE AND WE WILL OFFER YOU A 5% REBATE ON YOUR PROJECT! 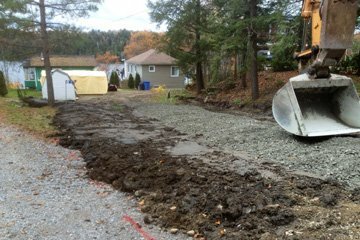 We have been setting standards for 10 years now in the Gatineau and Outaouais area for all your needs regarding septic tanks, septic field, crack repair and foundation waterproofing. Our company works fast, we are professionals and our work is neat. Get peace of mind by choosing a qualified and certified general contractor for all your renovation needs! We offer a complete range of services tailored to your needs. 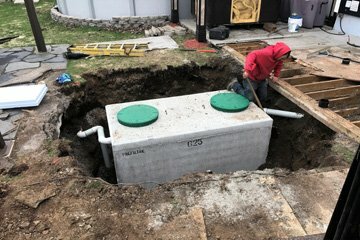 Whether you need us to waterproof your foundation, patch a crack in your foundation, excavate, a technologist, an engineer, soil tests, septic installation plans, install a septic tank and drainage field or even for construction and addition to your house, we’ll be up to the task. What is the benefit of doing business with Excavasec? There are several, but one of the major advantages is that our customers are the only people who can benefit from the new TUFF-N-DRI membrane. In fact, we are the only company that offers this membrane in the Ottawa, Gatineau and Outaouais region, and we do so at a very affordable price. You’re probably wondering what’s so special about this membrane… Until now, a cracked foundation could only be repaired by heating and sticking a tar membrane to the wall or by using a self-adhesive tar membrane. These options are far from being eco-friendly and as such cannot compete with our water-based TUFF-N-DRI membrane, which is LEED certified and which meets the highest environmental standards! In addition, repairs made with tar membranes can contain several edges and seams, which create a small risk of water infiltration. With the TUFF-N-DRI membrane, this problem is no longer an issue. We are also excavation specialists and offer a complete range of excavation services. We have the expertise and the right equipment for large projects like building stonewalls or digging swimming pools. Our services are available in Gatineau, Hull and Aylmer. 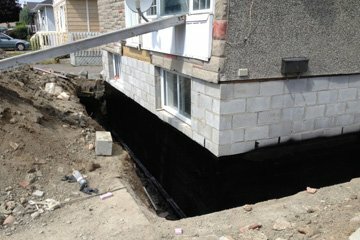 We specialize in repairing foundation cracks and doing excavation work in the Outaouais and Ottawa region! If you were looking for a general contractor to facilitate your renovation and construction project, you’ve just found him! We care about you project! 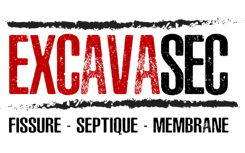 Ask us for a free estimate and we will offer you a 5% rebate on your project! We are proud to provide you with quality services and a team of experienced professionals you can count on. Visit our Project section to see our latest work and see our services! Excavasec © All rights reserved.